Here are my notes on the influential paper “Mesos: A Platform for Fine-Grained Resource Sharing in the Data Center”. My notes pertain only to the original the paper itself, and not improvements or changes in the theory or implementation of Apache Mesos since 2010. Mesos is “a platform for sharing commodity clusters between multiple diverse cluster computing frameworks”. A framework is a “software system that manages and executes one or more jobs on a cluster”, for example Hadoop, Spark, or MPI. Frameworks are responsible for running tasks, for example running a machine learning algorithm. When multiple frameworks run on a cluster without a platform like Mesos, there are often unintended consequences, for example one framework may grab resources for a job that would gave been better suited for another framework’s job. Multiple frameworks often run on a single cluster because different frameworks are best suited for different kinds of computational workloads. For example, Spark for iterative workloads on shared data, or Flink for streaming workloads. Mesos shares cluster resources across frameworks with the goals of high utilization and efficient data sharing. Cluster resources can be shared without a framework, for example by simply partitioning the nodes in cluster to frameworks, or by allocating virtual machines to each framework, but utilization and efficiency suffer. Frameworks decide which resources to accept and which tasks should run on them (using their own scheduler). Frameworks can continue to use their own schedulers. Mesos can accommodate newly developed frameworks. The Mesos implementation itself can be kept simple (since concerns are separated). Mesos is scalable, because Mesos does not attempt to compute a global schedule for all tasks across all frameworks. The primary disadvantage is that Mesos is denied the ability to globally optimize task allocation across frameworks. 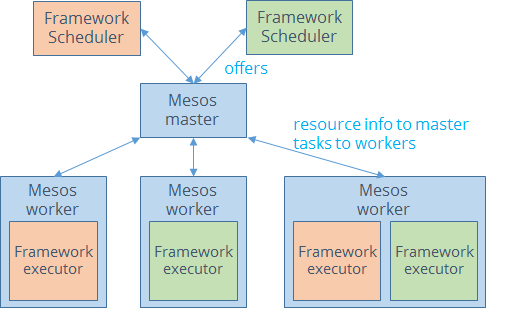 There are two components to the Mesos architecture: masters and workers. Masters are responsible for issuing offers to workers and interacting with workers and framework schedulers. Workers are responsible for running tasks on cluster resources. 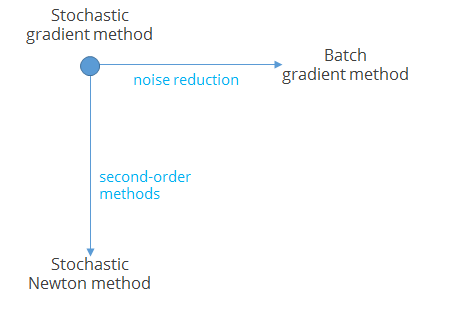 The two phase approach for task scheduling and execution is summarized in Figure 3 in the original paper. The process begins with workers reporting available resources. You can think of these “reports” as tuples (w_i, r_1, r_2, …r_n) where w_i identifies the worker, and r_1, …, r_n represent resource attributes. For example, r_1 may represent the number of CPUs, r_2 may represent memory, r_3 the presence or absence of a GPU, and so on. Armed with the knowledge of the capabilities of the cluster, the master can begin issuing offers to framework schedulers. An offer is also a tuple (w_i, r_1, …, r_n) – it’s a record that represents resources that a scheduler can choose to use. At this point, the framework scheduler can choose to either accept or reject the offer. Frameworks decide to accept or reject based on the pending list of tasks that need to be executed by the framework. There are legitimate reasons for rejecting offers even if tasks are pending; for example pending tasks may require a GPU but the offer does not include one. When an offer is accepted, the framework scheduler sends back a list of tuples (t_i, u_1, …, u_n), with t_i identifying a task to be executed, and u_i representing the resources that will be utilized by the task when it is executed. The master can then send the tasks to workers for execution. It also “adjusts the books” so that future resource offers will account for the running tasks. When tasks are completed, the master is notified so that it can then account for these newly available resources. It might be helpful to compare this process to home mortgages. In this world, Mesos plays the role of a mortgage broker. A Mesos offer represents the terms of a mortgage, offered to lenders (schedulers). An approval constitutes an agreement by a lender to fund the loan. As the paper notes, the ability for frameworks to reject offers is an important extensibility point that allows for frameworks to account for its own considerations, without burdening Mesos with the details. The process of brokering offers and launching tasks is the heart of Mesos. There are a number of important additional considerations, of course: how to handle long running or “zombie” tasks, task isolation, robustness, and fault tolerance. Mesos relies on existing framework or cluster node mechanisms to handle these considerations when possible, and adds simple policies to Mesos itself when this is not possible. This all falls under the general design principle of keeping Mesos simple. These mechanisms are described in Section 3 of the paper. The details are interesting but are not fundamental to understanding the design. Does not accept unknown resources. Frameworks that follow these guidelines yield high utilization when managed by Mesos. Mesos does not claim to be the only viable solution for cluster resource management. For example, in a traditional HPC-style cluster environment with specialized, largely homogeneous hardware and fixed-size jobs, centralized scheduling may be more appropriate. In a grid computing environment where geographically separate and separately administered resources are marshaled together for a computation (like me and my colleagues did for the famed “nug30” problem back in 2000), additional layers may need to sit on top of a framework such as Mesos. Nonetheless for many modern cluster workloads, especially those for large scale machine learning, Mesos is an excellent choice. This post walks through a simple Google TensorFlow example. TensorFlow is an open source library for analytics. It’s particularly useful for building deep learning systems for predictive models involving natural language processing, audio, and images. Running the development image “latest-devel” will provide you with code for all of the examples on the TensorFlow site. You don’t strictly speaking have to use docker to get started with TensorFlow, but that’s what worked for me. Do something with the output. I have marked these phases in the code below. y = x + b # here is our ‘model’: add one to the input. The next two lines create “placeholders” x and y. A placeholder is an interface between a computational graph element and your data. Placeholders can represent input or output, and in my case x represents the value to send in, and y represents the result. The second argument of the placeholder function is the shape of the placeholder, which is a single dimensional Tensor with one entry. You can also provide a name, which is useful for debugging purposes. The next line creates the constant b using tf.constant. As we will see in future examples, there are other TensorFlow functions for addition, multiplication, and so on. Using these helper functions you can assemble a very wide range of functions that involve inputs, outputs, and other intermediate values. In this example, we’re keeping it very simple. The next line, y = x + b, is the computational model we want TensorFlow to calculate. This line does not actually compute anything, even though it looks like it should. It simply creates data structures (called “graph elements”) that represent the addition of x and b, and the assignment of the result to the placeholder y. Each of the items in my picture above is a graph element. These graph elements are processed by the TensorFlow engine when Session.run() is called. Part of the magic of TensorFlow is to efficiently carry out graph element evaluation, even for very large and complicated graphs. Now that the model is created, we turn to assembling the input and running the model. Our model has one input x, so we create a list x_in that will be associated with the placeholder x. If you think of a TensorFlow model as a function in your favorite programming language, the placeholders are the arguments. Here we want to “pass” x_in as the value for the “parameter” x. This is what happens in the session.run() call. The first argument is a list of graph elements that you would like TensorFlow to evaluate. In this case, we’re interested in evaluating the output placeholder y, so that’s what we pass in. Session.run will return an output value for each graph element that you pass in as the first argument, and the value will correspond to the evaluated value for that element. In English this means that y_final is going to be an array that has the result: x + 1. The second argument to run is a dictionary that specifies the values for input placeholders. This is where we associate the input array x_in with the placeholder x. When Session.run() is called, TensorFlow will determine which elements of the computational graph need to be evaluated based on what you’ve passed in. It will then carry out the computations and then bind result values accordingly. The final line prints out the resulting array. This example is one of the simplest ones I could think of that includes all four key phases. It’s missing many of the core features of TensorFlow! In particular, machine learning models usually train certain values to predict or classify something, but we’re not doing that here. In my next post I will walk through another example shows how to train parameters in a simple predictive model.